The kitchen cabinets in a rental apartment should be built and designed to take some abuse, especially if you’re renting to families with young children or you have a high tenant turnover rate. 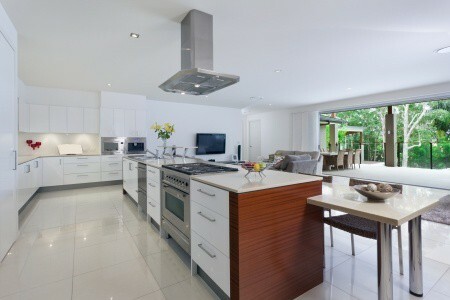 Of course, you also want to follow some of the latest trends, so the kitchen will look clean, new, and modern. If you’re careful about what trends you follow, you can create a kitchen that will look modern now and in the future, without the need to make significant changes to it as styles change. First, consider the color. Kitchen cabinets are generally white, or they look like wood. The type and color of wood can vary with changing trends. Light colors are popular for a while, and then dark colors are in. Eventually, light colors will become popular once again. White, though, is both classic and trendy. It’s a color that goes with everything, and that’s always in fashion. If you stick with white, you can make changes to other parts of the kitchen over time, and not need to replace the cabinets. That’s a great way to stay trendy and still save money. Second, storage options are very popular right now. Fortunately, they’ve always had a place in the kitchen and that trend will continue for the foreseeable future. There are a number of different ways to add storage to kitchen cabinets. Shelves and lazy Susans are popular, but you should also consider the trend of doing away with false door fronts and putting extra storage in those spaces. Even thin, narrow spaces can be used, most commonly for baking sheets, muffin tins, and pizza pans. Third, you can extend the storage idea with another popular trend: customizing drawers and islands to add even more space to a kitchen. Whether it’s big or small, kitchens really can’t have enough storage. Drawers that are designed to hold silverware in individual cubbies, islands that have outlets and extra space, and other customized options are very popular with tenants, especially in an apartment where space is often at a premium. While adding all these options may cost a little more, they’re trendy now and will be useful well into the future. That can make them worth the price. When you install new kitchen cabinets, you’ll want to consider having them go all the way to the ceiling. Not only does it look great and give the impression of height, but it also provides a lot more storage space. Items that aren’t used very much can be stored in the top cabinets, and the apartment’s kitchen will look and feel bigger. If you’re concerned about the floor-to-ceiling cabinets making the space actually seem smaller, consider glass-front cabinets or some open shelving, instead. No matter what choices you make for your rental apartment’s trendy new kitchen cabinets, though, choose cabinets that offer good quality for the price. It’s often tempting to buy the cheapest cabinets, but they’ll need replaced much sooner that way. By spending a little more, the cabinets you buy will last much longer and continue to look great for years.